Episode 74 - Two significant deaths this episode-- first Gatotkacha basically gets sacrificed by Krishna so that Arjun need not face Karna's special unstoppable Indra Dart. 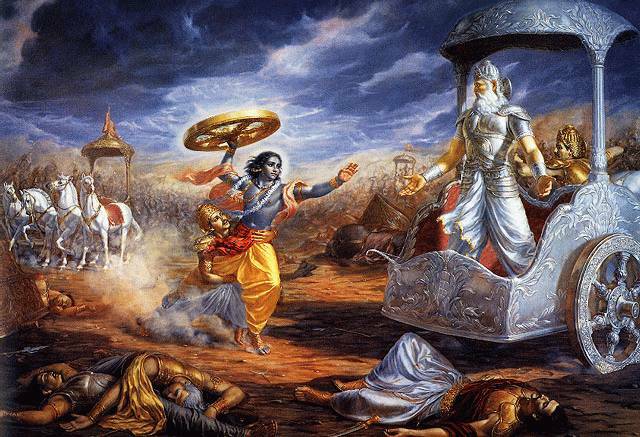 It's a mean trick, but Krishna explained that one of the purposes of this war is to eradicate the race of Rakshasas, so if they didn't have Karna kill him, then they would have had to do it themselves. Besides, it was a small price to pay in order to save Arjun for the final showdown. The second big shot to go down is their old guru Drona. I must confess that I never really took a shine to this fighting brahmin. He always seemed over-proud and a bit prickly. Also, I never liked the way he manipulated the Pandava kids into fighting his own grudge match with King Drupad. After he took half of Drupad's kingdom, he said that they could be friends again. Some friend-- he then kills Drupad earlier in the day without a second thought. And what the hell is a brahmin doing fighting anyway? They are supposed to merit their honor of being the priestly caste by dedicating their lives to ritual and spirituality. But here's this guy who demands the highest honor for being from the priestly caste, and yet he fights dirty-- in ways that a kshatriya would be ashamed to fight, such as using magic weapons against footsoldiers. His ounce of loyalty goes to the guys who feed him & pay him, and all the rest of his love is for his own skin, and that of his dear son, Ashvatthaman. More on that punk later. Man, I really don't like Drona! Anyway, next time we'll find out what Ashwatthaman does when he hears the news.